Inflammation, allergies, and histamine issues affect so many people today, irritating us with a variety of seemingly unrelated symptoms. Histamine intolerance is a term applied to the symptoms that occur due to eating too many histamine-containing foods. Symptoms of histamine intolerance include the allergy-type symptoms (sinus drainage, itching, watery eyes, hives), gastrointestinal symptoms (diarrhea, stomach pain, heartburn, nausea), and brain-related symptoms (anxiety, insomnia, headaches). 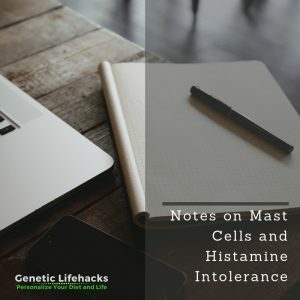 Getting to the bottom of my own histamine related problems prompted me to search for the ‘root causes’ for histamine intolerance. 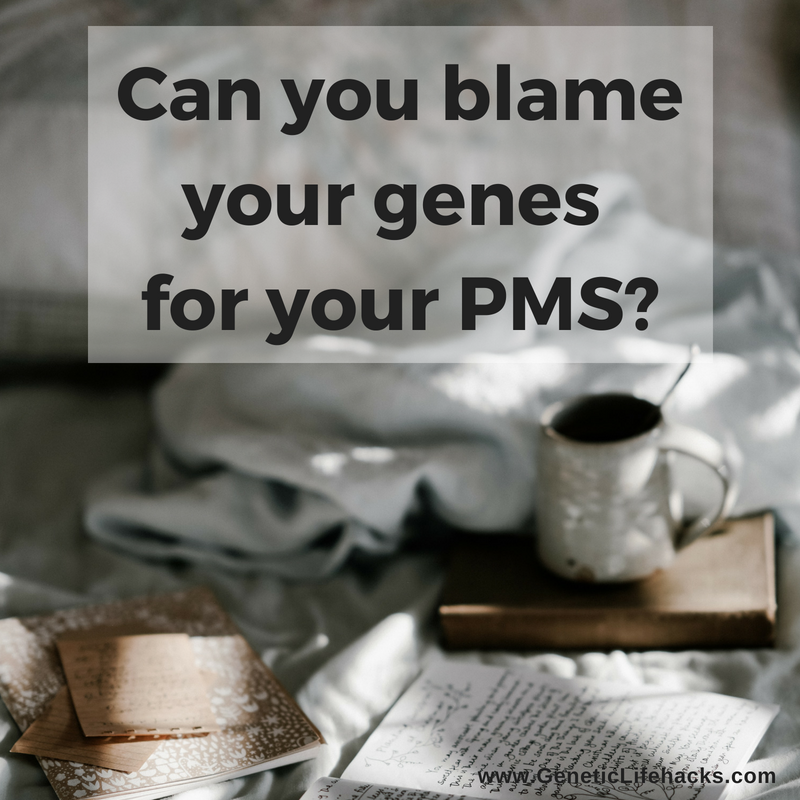 I broke this problem down by looking at how our body produces histamine, the ways that histamine is used, triggers for producing too much, and solutions for blocking the release of histamine. This is a departure from my usual articles on genetic variants. If you are interested in some of the genes involved in histamine intolerance, please read my article on the genetic variants involved in histamine intolerance. While those genetic variants do play a role in histamine-related issues, they exacerbate the problem rather than being a single cause. Hopefully, something in the studies below will help you to figure out a root cause of your own histamine related issues. Also activated by protozoa, helminth (worms), and lipopolysaccharides (toxins from certain bacteria) [study]. Basophils, another type of white blood cell and a part of our immune system, can also release histamine. Histamine is generated by histamine decarboxylase enzyme (HDC gene) which converts histidine, an amino acid, to histamine. We have four different histamine receptors in the body, giving rise to the huge variety in symptoms of histamine related problems. IgE (typical allergy) is the normal way that mast cells are activated. The antigen links to a receptor on the cell surface causing degranulation. There is lots of information and studies on IgE / allergic reactions and histamine. “Calcium triggers the secretion of histamine from mast cells after previous exposure to sodium fluoride.” [study] And we put sodium fluoride in our water — since 1960 in the US. Here is a proposal to use cimetidine(Tagamet), which is an H2 blocker used for heartburn, in conjunction with other treatments for Lyme disease. Another role that mast cells play in the immune response is to react to fungi, specifically, this 2016 study used Malassezia sympodialis which binds to the Decklin-1 (aka CLEC7A) receptor on the mast cell and causes degranulation. Curdlan was also used in the study and shown to bind to the Decklin-1 receptor on mast cells. So what is curdlan? It is a beta-glucan produced by certain bacteria used as a food additive (gum) allowed in the US but not in the EU. In a mouse study using histamine knockout mice, it was found that histamine lowered body temperature only in mice with a functioning HDC (histamine decarboxylase) gene. Another study from the 1950’s looked at the effect of histamine on body temperature in several mammals and found that adding histamine lowered body temperature. Another 2016 study found that histamine was involved in low body temperature set point using the H1 receptor. BMI and skin reactivity in people with nasal allergies are all linked. Switching gears here to focus on some of the things we can do to reduce histamine related problems. The first line of defense is to lower histamine levels from food through eating a low histamine diet. You can use this list of histamine-containing foods as a starting point for customizing your low-histamine diet. The way that a food is processed can change how much of an IgE reaction a person has to it. Here is a study discussing the different effects of processing on hazelnuts [study]. I’m throwing this in here to explain (at least to myself) one reason why food that is fine sometimes, at other times will cause a histamine reaction. Arsenic inhibits mast cell degranulation [study] Still not a good reason to eat arsenic in rice. Interesting study on retinoic acid (vitamin A) and mast cells— inhibits proliferation of mast cells but not histamine release. While I’ve focused here on mast cells misbehaving, they do play an important role in immune function and shouldn’t be suppressed too much. For example, a study of diabetic wound healing found that reduced mast cell function was what caused the extended wound healing time. This increased wound healing from mast cells may also play a role in how low-level laser therapy works in wound healing. Great Article! What about the connection of Epstein Barr Virus possibly being a mast-cell trigger? Thanks for reading the article! I haven’t really looked into EBV as a mast-cell trigger. I’m putting it on my list of things to read about! Seems like EBV can play a role in a lot of different chronic issues… Maybe I need to do a blog post on the link between genes and susceptibility to EBV. I had looked into it a few years ago when mono was going around with my kids and found that there are several different genes that play a role in a person’s response to the Epstein Barr virus. I used to be healthy, hitting the gym almost everyday and eating almost anything I wanted, that is until I contracted EBV 5 years ago. After that I was constantly getting sick with colds at times of the year other than winter, having allergies, other symptoms, including no longer able to tolerate caffeine, and getting sick or feeling ill after exercising, and bad reactions after certain foods. However, I noticed I could get some relief with Zyrtec. Took 4 years until I read about Histamine Intolerance on the web and realized what my problem now is. So there is most definitely a connection between EBV and mast cell activation disorder/histamine intolerance. I’m glad you are figuring out your histamine problems. I’ve heard the same thing from other about Epstein Barr triggering longer-term problems. There is a genetic component to the likelihood of getting mono from EBV, so I wouldn’t be surprised to find that there are gene variants tied to long-term problems with the virus. My 5 year old Grandson has EOE. ANY of this could be causing his illness? Doctors cannot decide which branch he is in. He also has a problem with his muscles not supporting his body. Any information would be greatly appreciated. I don’t know much about eosinophilic esophagitis, but it makes sense that mast cells would be involved. A quick pubmed search turned up quite a few studies looking into the link between EoE and mast cells. Here is one from a few years ago: https://www.ncbi.nlm.nih.gov/pmc/articles/PMC3680716/ The introduction to the study has some good background information, and there are quite a few other studies that cite this study that may be good to read. Hope this helps you in your search for more information to help out your grandson. Hi, Dana, You might consider Ehlers Danlos as to the muscular issues. EDS causes faulty connective tissue and can manifest in many different ways–and many have EOE and mast cell issues. I hope you find some answers soon! How do we find out what genes are associated with the histamine sensitivity following the EBV. Any ideas of what to do if you believe this could be associated with my sons inability to gain weight and ADD? Bob Miller at NutriGenetic Research is looking into genetic variants in relation to mast cells and inflammation. He teaches an incredibly well-organized and insightful class, MethylGenetic Nutrition and his organization will soon be offering its own genetic testing, far more robust and extensive than 23andMe. Should add this research. After eating food for years that was often “old” food (rich meal with vegetables, but kept in the fridge for too long and eaten) and a possible infection of bedbugs/other insects (or a chronic reaction to their pooping) caused me for years to experience joint pains. I thought it was all about old age. I am a serious tennis player and am generally fit, but I saw my general condition fall over the last 4 or 5 years. Whatever was the real cause before (old food,…), one day, I considered checking my mattress (from a 2 year old rental). No sign. It looked new on the surface, but then when I lifted it, under, on the boards that were holding it, I found what could be described as yellow stains (possible bedbug or something else (other insect). I cleaned with paper towel without any protection (just some water) and within a few hours both of my hands swelled. After, I noticed that my joint pains were getting stronger and more intense than before. Then, good luck, I read this: https://gizmodo.com/bed-bugs-are-pooping-histamine-into-our-homes-and-possi-1822940326. I have eaten low-histamine foods for 4 weeks now and ALL my joint pains have vanished. The itchy hives have vanished too.